US residents ages 18 and over. Because of the risks of addiction, abuse, and misuse with opioids, even at recommended doses, and because of the greater risks of overdose and death with extended-release opioid formulations, reserve NUCYNTA ER for use in patients for whom alternative treatment options (e.g., non-opioid analgesics or immediate‑release opioids) are ineffective, not tolerated, or would be otherwise inadequate to provide sufficient management of pain. NUCYNTA ER is not indicated as an as-needed (prn) analgesic. NUCYNTA ER exposes patients and other users to the risks of opioid addiction, abuse, and misuse, which can lead to overdose and death. Assess each patient's risk prior to prescribing NUCYNTA ER, and monitor all patients regularly for the development of these behaviors and conditions. Serious, life-threatening, or fatal respiratory depression may occur with use of NUCYNTA ER. Monitor for respiratory depression, especially during initiation of NUCYNTA ER or following a dose increase. Instruct patients to swallow NUCYNTA ER tablets whole; crushing, chewing, or dissolving NUCYNTA ER tablets can cause rapid release and absorption of a potentially fatal dose of tapentadol. Accidental ingestion of even one dose of NUCYNTA ER, especially by children, can result in a fatal overdose of tapentadol. Prolonged use of NUCYNTA ER during pregnancy can result in neonatal opioid withdrawal syndrome, which may be life-threatening if not recognized and treated, and requires management according to protocols developed by neonatology experts. If opioid use is required for a prolonged period in a pregnant woman, advise the patient of the risk of neonatal opioid withdrawal syndrome and ensure that appropriate treatment will be available. Instruct patients not to consume alcoholic beverages or use prescription or non-prescription products that contain alcohol while taking NUCYNTA ER. The co-ingestion of alcohol with NUCYNTA ER may result in increased plasma tapentadol levels and a potentially fatal overdose of tapentadol. Reserve concomitant prescribing of NUCYNTA ER and benzodiazepines or other CNS depressants for use in patients for whom alternative treatment options are inadequate. NUCYNTA ER contains tapentadol, a Schedule II controlled substance. As an opioid, NUCYNTA ER exposes users to the risks of addiction, abuse, and misuse. Because extended-release products such as NUCYNTA ER deliver the opioid over an extended period of time, there is a greater risk for overdose and death due to the larger amount of tapentadol present. Although the risk of addiction in any individual is unknown, it can occur in patients appropriately prescribed NUCYNTA ER. Addiction can occur at recommended doses and if the drug is misused or abused. Assess each patient's risk for opioid addiction, abuse, or misuse prior to prescribing NUCYNTA ER, and monitor all patients receiving NUCYNTA ER for the development of these behaviors and conditions. Risks are increased in patients with a personal or family history of substance abuse (including drug or alcohol abuse or addiction) or mental illness (e.g., major depression). The potential for these risks should not, however, prevent the prescribing of NUCYNTA ER for the proper management of pain in any given patient. Patients at increased risk may be prescribed opioids such as NUCYNTA ER, but use in such patients necessitates intensive counseling about the risks and proper use of NUCYNTA ER along with intensive monitoring for signs of addiction, abuse, and misuse. Abuse or misuse of NUCYNTA ER by crushing, chewing, snorting, or injecting the dissolved product will result in the uncontrolled delivery of tapentadol and can result in overdose and death. Opioids are sought by drug abusers and people with addiction disorders and are subject to criminal diversion. Consider these risks when prescribing or dispensing NUCYNTA ER. Strategies to reduce these risks include prescribing the drug in the smallest appropriate quantity and advising the patient on the proper disposal of unused drug. Contact the local state professional licensing board or state controlled substances authority for information on how to prevent and detect abuse or diversion of this product. To obtain further information on the opioid analgesic REMS and for a list of accredited REMS CME/CE, call 1‑800‑503‑0784, or log on to www.opioidanalgesicrems.com. The FDA Blueprint can be found at www.fda.gov/OpioidAnalgesicREMSBlueprint. Serious, life-threatening, or fatal respiratory depression has been reported with the use of opioids, even when used as recommended. Respiratory depression, if not immediately recognized and treated, may lead to respiratory arrest and death. Management of respiratory depression may include close observation, supportive measures, and use of opioid antagonists, depending on the patient's clinical status. Carbon dioxide (CO2) retention from opioid-induced respiratory depression can exacerbate the sedating effects of opioids. While serious, life-threatening, or fatal respiratory depression can occur at any time during the use of NUCYNTA ER, the risk is greatest during the initiation of therapy or following a dosage increase. Monitor patients closely for respiratory depression especially within the first 24-72 hours of initiating therapy with and following dosage increases of NUCYNTA ER. To reduce the risk of respiratory depression, proper dosing and titration of NUCYNTA ER are essential. Overestimating the NUCYNTA ER dosage when converting patients from another opioid product can result in fatal overdose with the first dose. Accidental ingestion of even one dose of NUCYNTA ER, especially by children, can result in respiratory depression and death due to an overdose of tapentadol. Prolonged use of NUCYNTA ER during pregnancy can result in withdrawal in the neonate. Neonatal opioid withdrawal syndrome, unlike opioid withdrawal syndrome in adults, may be life-threatening if not recognized and treated, and requires management according to protocols developed by neonatology experts. Observe newborns for signs of neonatal opioid withdrawal syndrome and manage accordingly. Advise pregnant women using opioids for a prolonged period of the risk of neonatal opioid withdrawal syndrome and ensure that appropriate treatment will be available. Patients must not consume alcoholic beverages or prescription or non-prescription products containing alcohol while on NUCYNTA ER therapy. The co-ingestion of alcohol with NUCYNTA ER may result in increased plasma tapentadol levels and a potentially fatal overdose of tapentadol. Profound sedation, respiratory depression, coma, and death may result from the concomitant use of NUCYNTA ER with benzodiazepines or other CNS depressants (e.g., non-benzodiazepine sedatives/hypnotics, anxiolytics, tranquilizers, muscle relaxants, general anesthetics, antipsychotics, other opioids, alcohol). Because of these risks, reserve concomitant prescribing of these drugs for use in patients for whom alternative treatment options are inadequate. Advise both patients and caregivers about the risks of respiratory depression and sedation when NUCYNTA ER is used with benzodiazepines or other CNS depressants (including alcohol and illicit drugs). Advise patients not to drive or operate heavy machinery until the effects of concomitant use of the benzodiazepine or other CNS depressants have been determined. Screen patients for risk of substance use disorders, including opioid abuse and misuse, and warn them of the risk for overdose and death associated with the use of additional CNS depressants including alcohol and illicit drugs. The use of NUCYNTA ER in patients with acute or severe bronchial asthma in an unmonitored setting or in the absence of resuscitative equipment is contraindicated. Patients with Chronic Pulmonary Disease: NUCYNTA ER-treated patients with significant chronic obstructive pulmonary disease or cor pulmonale, and those with a substantially decreased respiratory reserve, hypoxia, hypercapnia, or pre-existing respiratory depression are at increased risk of decreased respiratory drive including apnea, even at recommended dosages of NUCYNTA ER. Elderly, Cachectic, or Debilitated Patients: Life-threatening respiratory depression is more likely to occur in elderly, cachectic, or debilitated patients because they may have altered pharmacokinetics or altered clearance compared to younger, healthier patients. Alternatively, consider the use of non-opioid analgesics in these patients. Monitor such patients closely, particularly when initiating and titrating NUCYNTA ER and when NUCYNTA ER is given concomitantly with other drugs that depress respiration. Cases of serotonin syndrome, a potentially life-threatening condition, have been reported during concomitant use of tapentadol with serotonergic drugs. Serotonergic drugs include selective serotonin reuptake inhibitors (SSRIs), serotonin and norepinephrine reuptake inhibitors (SNRIs), tricyclic antidepressants (TCAs), triptans, 5‑HT3 receptor antagonists, drugs that affect the serotonergic neurotransmitter system (e.g., mirtazapine, trazodone, tramadol), and drugs that impair metabolism of serotonin (including MAO inhibitors, both those intended to treat psychiatric disorders and also others, such as linezolid and intravenous methylene blue). This may occur within the recommended dosage range. Serotonin syndrome symptoms may include mental status changes (e.g., agitation, hallucinations, coma), autonomic instability (e.g., tachycardia, labile blood pressure, hyperthermia), neuromuscular aberrations (e.g., hyperreflexia, incoordination, rigidity), and/or gastrointestinal symptoms (e.g., nausea, vomiting, diarrhea). The onset of symptoms generally occurs within several hours to a few days of concomitant use, but may occur later than that. Discontinue NUCYNTA ER if serotonin syndrome is suspected. Cases of adrenal insufficiency have been reported with opioid use, more often following greater than one month of use. Presentation of adrenal insufficiency may include non‑specific symptoms and signs including nausea, vomiting, anorexia, fatigue, weakness, dizziness, and low blood pressure. If adrenal insufficiency is suspected, confirm the diagnosis with diagnostic testing as soon as possible. If adrenal insufficiency is diagnosed, treat with physiologic replacement doses of corticosteroids. Wean the patient off of the opioid to allow adrenal function to recover and continue corticosteroid treatment until adrenal function recovers. Other opioids may be tried as some cases reported use of a different opioid without recurrence of adrenal insufficiency. The information available does not identify any particular opioids as being more likely to be associated with adrenal insufficiency. NUCYNTA ER may cause severe hypotension including orthostatic hypotension and syncope in ambulatory patients. There is an increased risk in patients whose ability to maintain blood pressure has already been compromised by a reduced blood volume or concurrent administration of certain CNS depressant drugs (e.g., phenothiazines or general anesthetics). Monitor these patients for signs of hypotension after initiating or titrating the dosage of NUCYNTA ER. In patients with circulatory shock, NUCYNTA ER may cause vasodilation that can further reduce cardiac output and blood pressure. Avoid the use of NUCYNTA ER in patients with circulatory shock. In patients who may be susceptible to the intracranial effects of CO2 retention (e.g., those with evidence of increased intracranial pressure or brain tumors), NUCYNTA ER may reduce respiratory drive, and the resultant CO2 retention can further increase intracranial pressure. Monitor such patients for signs of sedation and respiratory depression, particularly when initiating therapy with NUCYNTA ER. Opioids may also obscure the clinical course in a patient with a head injury. Avoid the use of NUCYNTA ER in patients with impaired consciousness or coma. NUCYNTA ER is contraindicated in patients with known or suspected gastrointestinal obstruction, including paralytic ileus. The tapentadol in NUCYNTA ER may cause spasm of the sphincter of Oddi. Opioids may cause increases in serum amylase. Monitor patients with biliary tract disease, including acute pancreatitis, for worsening symptoms. The tapentadol in NUCYNTA ER may increase the frequency of seizures in patients with seizure disorders and may increase the risk of seizures in other clinical settings associated with seizures. Monitor patients with a history of seizure disorders for worsened seizure control during NUCYNTA ER therapy. Avoid the use of mixed agonist/antagonist (e.g., pentazocine, nalbuphine, and butorphanol) or partial agonist (e.g., buprenorphine) analgesics in patients who have received or are receiving a course of therapy with a full opioid agonist analgesic, including NUCYNTA ER. In these patients, mixed agonists/antagonists and partial agonist analgesics may reduce the analgesic effect and/or may precipitate withdrawal symptoms. When discontinuing NUCYNTA ER, gradually taper the dose. Do not abruptly discontinue NUCYNTA ER. NUCYNTA ER may impair the mental or physical abilities needed to perform potentially hazardous activities such as driving a car or operating machinery. Warn patients not to drive or operate dangerous machinery unless they are tolerant to the effects of NUCYNTA ER and know how they will react to the medication. A study with an immediate-release formulation of tapentadol in subjects with hepatic impairment showed higher serum concentrations of tapentadol than in those with normal hepatic function. Avoid use of NUCYNTA ER in patients with severe hepatic impairment. Reduce the dose of NUCYNTA ER in patients with moderate hepatic impairment. Closely monitor patients with moderate hepatic impairment for respiratory and central nervous system depression when initiating and titrating NUCYNTA ER. Use of NUCYNTA ER in patients with severe renal impairment is not recommended due to accumulation of a metabolite formed by glucuronidation of tapentadol. The clinical relevance of the elevated metabolite is not known. In clinical studies, the most common (≤10%) adverse reactions were nausea, constipation, dizziness, headache, and somnolence. Please see full Prescribing Information for more information about NUCYNTA ER. *Offer valid for commercially insured patients only. Maximum savings limit applies; patient out‑of‑pocket expense may vary. Please see Program Terms, Conditions, and Eligibility Criteria, below. For Indications and Usage and Important Safety Information for NUCYNTA ER, click here. Please see full Prescribing Information, including Boxed Warning and Medication Guide, for more information about NUCYNTA ER. Offer is valid for commercially insured patients only. Most eligible commercially insured patients will pay as little as $35 (maximum benefit amount of $100) for Nucynta ER or Nucynta tablets. Any remaining out-of-pocket expense will be the patient's responsibility. This offer is valid in the United States. Some restrictions may apply. Offer not valid for prescriptions reimbursed under Medicaid, a Medicare drug benefit plan, Tricare or other federal or state health programs (such as medical assistance programs). Cash Discount Cards and other non-insurance plans are not valid as primary under this offer. If the patient is eligible for drug benefits under any such program, the patient cannot use this offer. By using this offer, the patient certifies that he or she will comply with any terms of his or her health insurance contract requiring notification to his or her payer of the existence and/or value of this offer. This offer is not valid for cash paying patients. Offer not valid for patients under 18 years of age. Program not valid in Massachusetts. Patient Instructions: To redeem this offer, you must have a valid prescription for Nucynta ER or Nucynta and follow the dosage instructions provided by your healthcare provider with a valid Prescriber ID# (e.g. NPI or DEA). This offer may not be redeemed for cash. Patients with questions about the Nucynta ER or Nucynta savings offer should call 1‑844‑807‑0348. Pharmacist: When you apply this offer, you are certifying that you have not submitted a claim for reimbursement under any federal, state, or other governmental programs for this prescription. Participation in this program must comply with all applicable laws and regulations as a pharmacy provider. Pharmacist instructions for a patient with an Eligible Third Party Payer: Submit the claim to the primary Third Party Payer first, then submit the balance due to Change Healthcare as a Secondary Payer COB [coordination of benefits] with patient responsibility amount and a valid Other Coverage Code (e.g. 8). 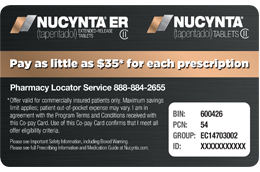 Most eligible commercially insured patients will pay as little as $35 (maximum benefit amount of $100) for Nucynta® ER or Nucynta® tablets. Reimbursement will be received from Change Healthcare. Valid Other Coverage Code required. For any questions regarding Change Healthcare online processing, please call the Help Desk at 1‑800‑433‑4893. Also used to manage pain from damaged nerves (neuropathic pain) that happens with diabetes and is severe enough to require daily around-the-clock, long-term treatment with an opioid, when other pain treatments such as non-opioid pain medicines do not treat your pain well enough or you cannot tolerate them. Not used to treat pain that is not around-the-clock pain. Get emergency help right away if you take too much NUCYNTA ER (overdose). When you first start taking NUCYNTA ER, when your dose is changed, or if you take too much (overdose), serious or life threatening breathing problems that can lead to death may occur. Taking NUCYNTA ER with other opioid medicines, benzodiazepines, alcohol, or other central nervous system depressants (including street drugs) can cause severe drowsiness, decreased awareness, breathing problems, coma, and death. Never give anyone your NUCYNTA ER. They could die from taking it. Store NUCYNTA ER away from children and in a safe place to prevent stealing or abuse. Selling or giving away NUCYNTA ER is against the law. Pregnant or planning to become pregnant. Prolonged use of NUCYNTA ER during pregnancy can cause withdrawal symptoms in your newborn baby that could be life-threatening if not recognized and treated. Breastfeeding. Not recommended during treatment with Nucynta ER. It may harm your baby. Taking prescription or over-the-counter medicines, vitamins, or herbal supplements. Taking NUCYNTA ER with certain other medicines can cause serious side effects. Do not change your dose. Take NUCYNTA ER exactly as prescribed by your healthcare provider. Use the lowest effective dose for the shortest time needed. Take your prescribed dose every 12 hours, at the same time every day. Do not take more than your prescribed dose in 24 hours. If you miss a dose, take your next dose at your usual time. Swallow NUCYNTA ER whole. Do not cut, break, chew, crush, dissolve, snort, or inject NUCYNTA ER because this may cause you to overdose and die. Do not stop taking NUCYNTA ER without talking to your healthcare provider. After you stop taking NUCYNTA ER, flush any unused tablets down the toilet. Serious, life‑threatening, or fatal respiratory depression may occur with use of NUCYNTA ER. Monitor for respiratory depression, especially during initiation of NUCYNTA ER or following a dose increase. Instruct patients to swallow NUCYNTA ER tablets whole; crushing, chewing, or dissolving NUCYNTA ER tablets can cause rapid release and absorption of a potentially fatal dose of tapentadol. Drive or operate heavy machinery until you know how NUCYNTA ER affects you. NUCYNTA ER can make you sleepy, dizzy, or lightheaded. Drink alcohol, or use prescription or over-the-counter medicines containing alcohol. Using products containing alcohol during treatment with NUCYNTA ER may cause you to overdose and die. Agitation, hallucinations, coma, feeling overheated, or heavy sweating. Please see full Prescribing Information, including Boxed Warning and Medication Guide, or speak to your healthcare provider if you have questions about NUCYNTA ER. A strong prescription pain medicine that contains an opioid (narcotic) that is used to manage short term (acute) pain in adults, when other pain treatments such as non-opioid pain medicines do not treat your pain well enough or you cannot tolerate them. Get emergency help right away if you take too much NUCYNTA (overdose) tablets. When you first start taking NUCYNTA tablets, when your dose is changed, or if you take too much (overdose), serious or life-threatening breathing problems that can lead to death may occur. Taking NUCYNTA tablets with other opioid medicines, benzodiazepines, alcohol, or other central nervous system depressants (including street drugs) can cause severe drowsiness, decreased awareness, breathing problems, coma, and death. Never give anyone else your NUCYNTA tablets. They could die from taking it. Store NUCYNTA tablets away from children and in a safe place to prevent stealing or abuse. Selling or giving away NUCYNTA tablets is against the law. Pregnant or planning to become pregnant. Prolonged use of NUCYNTA tablets during pregnancy can cause withdrawal symptoms in your newborn baby that could be life-threatening if not recognized and treated. Breastfeeding. NUCYNTA tablets pass into breast milk and may harm your baby. Taking prescription or over-the-counter medicines, vitamins, or herbal supplements. Taking NUCYNTA tablets with certain other medicines can cause serious side effects that could lead to death. Do not change your dose. Take NUCYNTA tablets exactly as prescribed by your healthcare provider. Use the lowest dose possible for the shortest time needed. Take your prescribed dose every 4-6 hours, at the same time every day. Do not take more than your prescribed dose. If you have been taking NUCYNTA tablets regularly, do not stop taking NUCYNTA tablets without talking to your healthcare provider. After you stop taking NUCYNTA tablets, flush any unused tablets down the toilet. NUCYNTA tablets expose patients and other users to the risks of opioid addiction, abuse, and misuse, which can lead to overdose and death. Assess each patient's risk prior to prescribing NUCYNTA tablets, and monitor all patients regularly for the development of these behaviors and conditions. Serious, life‑threatening, or fatal respiratory depression may occur with use of NUCYNTA tablets. Monitor for respiratory depression, especially during initiation of NUCYNTA tablets or following a dose increase. Accidental ingestion of even one dose of NUCYNTA tablets, especially by children, can result in a fatal overdose of tapentadol. Prolonged use of NUCYNTA tablets during pregnancy can result in neonatal opioid withdrawal syndrome, which may be life‑threatening if not recognized and treated, and requires management according to protocols developed by neonatology experts. If opioid use is required for a prolonged period in a pregnant woman, advise the patient of the risk of neonatal opioid withdrawal syndrome and ensure that appropriate treatment will be available. Reserve concomitant prescribing of NUCYNTA tablets and benzodiazepines or other CNS depressants for use in patients for whom alternative treatment options are inadequate. Drive or operate heavy machinery, until you know how NUCYNTA tablets affect you. NUCYNTA tablets can make you sleepy, dizzy, or lightheaded. Drink alcohol or use prescription or over-the-counter medicines that contain alcohol. Using products containing alcohol during treatment with NUCYNTA tablets may cause you to overdose and die. Please see full Prescribing Information, including Boxed Warning and Medication Guide, or speak to your healthcare provider if you have questions about NUCYNTA tablets. © 2018 Collegium Pharmaceutical, Inc. This site contains information for licensed healthcare professionals in the United States. By entering this website you acknowledge that you are a licensed healthcare professional practicing in the United States.